This is the first time my wife, Kijin and I have been to New York. We absolutely loved it! Saw an off Broadway musical called the Altar Boys. Brilliant and halarious. I highly recommend it. Went to Korea Town often and had some great meals there. As for my overall impressions of New York Comic-Con, I can say it was well run and the organizers at Reed Expo did all they can to make it successfull. In fact, a little TOO successfull. There was overcrowding on Saturday, so people were turned down admission to the show. Even though the show was busy, I found that my sales were down from Toronto and Chicago. This was probably due to a variety of factors. First, I shared a table with another artist. So instead of a 6' table, I was only working with a 3' table. And I had nowhere to put my banner other than behind my seat. That was unfortunate because many people passed by the table, and I had to work hard to get people's attention. By the end of Saturday, I was exhuasted. The second factor is the limited time. I had do leave three hours early on Sunday to catch my flight, so that cut into the sales as well. Eventually I'll add a chart to my website for aspiring publishers to compare sales. Hopefully it will be valuable information for them. This week was really busy! Over at Core DP, I am working on two movies, Silent Hill and Firehouse Dog. Then I had a last minute Mattel freelance project that I couldn't turn down. But I still managed to get the Issue 2 Preview printed yesterday, and boy does it look good! It will be onsale for only $2. Comes with an 11 page preview, and some pinups and sketches. The full colour version of Crozonia Issue 2 will debut in Chicago Wizard World. If there are some books left over from New York, I will make them available at the online store. Oh yeah! 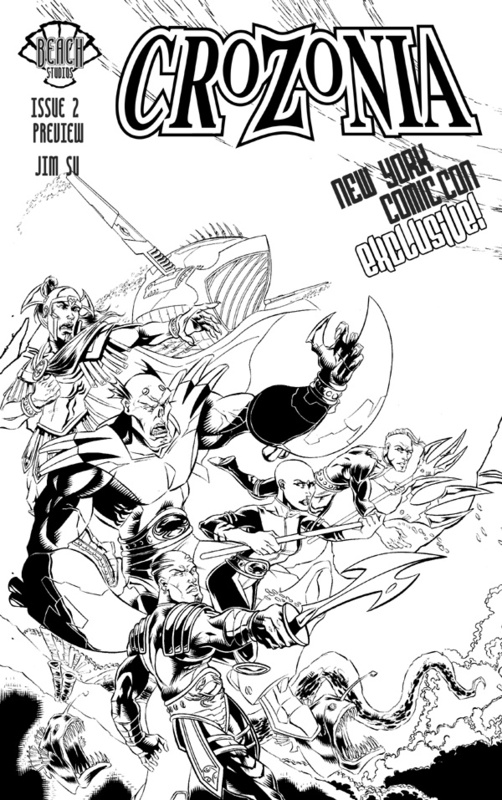 New York Comic-Con is only a few weeks away (Feb 24-26). There will be an exclusive ashcan printed just for this show. The cover may be in colour, still crunching down prices.